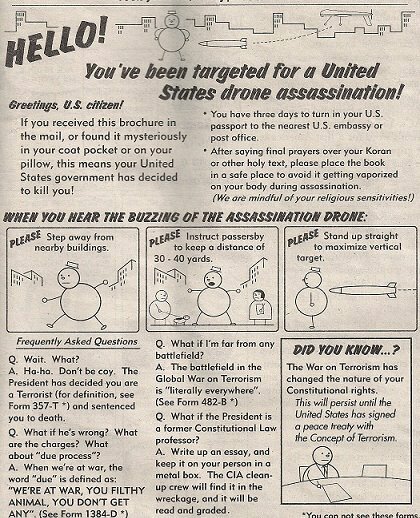 Who’s to say that some day they might expand their definition of ‘terrorist’ so that even outspoken tax protesters could be deemed a dangerous threat and thus on the drone list. Far-fetched but not out-of-the-question. Funny, but chilling. Frankly, with what we have seen, I wouldn’t put it past them. Second, expand the definition to include more and more people in the “permissible” group to be killed. You will see more and more people killed by U.S. drones. @USC, exactly. At first, it will just be the obvious Al Queida terrorists they’ll target; then, as times passes, especially if the economy collapses, they’ll become more desperate and expand their definition of the ‘permissible’ group to be killed. As for ourselves, I think it’s more likely that once the FATCA reporting takes place from spring 2015 that we’ll see more foreign accounts being frozen as has recently happened in Israel. We shall fight drones on the beaches. 1. Bank accounts outside the U.S. are associated with terrorist activity. 2. U.S. citizens abroad use bank accounts outside the U.S. Therefore, U.S. citizens are presumed to be associated with terrorist activities. In the context of the FBAR rules, this would mean that failure to report would be understood to be hiding evidence of terrorism. So, as time goes on, the U.S. government will see no logical problem in droning any U.S. citizen abroad based solely on having a bank outside the U.S.
Perhaps as a protective measure U.S. citizens abroad should stop using anything that is reportable on an FBAR. And finally, on the point of the definition of a terrorist/terrorism. Any violence directed against the U.S. by an entity other than a foreign government. Finally, what I am describing won’t happen next week, next month or next year. But, it will happen. “But, to be perfectly clear”: U.S. citizens abroad are nothing more than collateral damage in the war of terror. Be honest: Don’t you feel a bit of pride in being selected to die for your country? Ex-pats! Remember to stand up straight to maximize the vertical target.